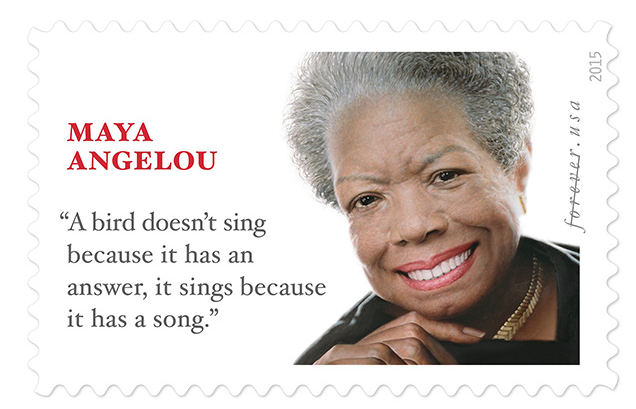 Maya Angelou stamp misattribution: "Bird" quote from different writer. Above is the U.S. Postal Service’s new Maya Angelou stamp, officially issued Tuesday and available now for purchase. The quotation printed on the stamp seems like the kind of line that might have come from Angelou’s famous memoir, I Know Why the Caged Bird Sings, and it’s been attributed to Angelou on a number of websites and even in a July 2014 speech by President Obama. (Angelou died in May 2014.) But the Washington Post reports that it in fact originally appeared in a 1960s poetry collection by a woman named Joan Walsh Anglund, who’s now 89 years old and hadn’t heard about the stamp until she spoke to the Post. A Postal Service spokesman, Mark Saunders, initially said he had never heard of the Anglund quote until The Washington Post informed him of it. In response, he sent a link to a 2013 blog post interview that quoted Angelou saying the phrase. 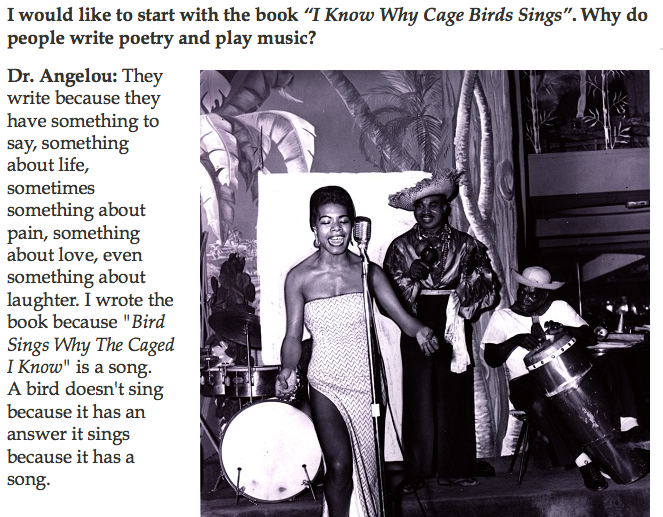 Saunders is apparently referring to this post on a Greek blues-music website, an interview which does quote Angelou using the phrase, though she doesn’t claim that she herself was its originator. The debunking sites Quote Investigator and Snopes don’t appear to have researched the origin of the phrase’s attribution to Angelou. The earliest such attribution in the Nexis news database is from a 2000 New Jersey Star-Ledger piece that says it appears in an anthology called Quotable Birder.